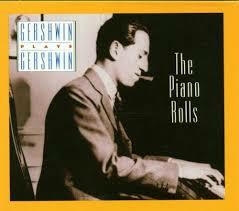 Any pianist who wants to play 20th century pop music and/or jazz needs to know the music of George Gershwin. Gershwin is probably most people’s favorite American composer – he is certainly mine – and the quality of his songwriting and innovations at the start of the jazz era laid the foundation for the development of both pop and jazz throughout the 20th century. While Gershwin may be better known these days for his “serious” works such as the Piano Concerto in F and Porgy and Bess (which he modestly called “the greatest music ever written in America” – and I can’t disagree), he was better known in his own time for his songs, most of which were written for musicals, and later, films. In those golden years at the start of the recording era when the piano was still the instrument, Gershwin’s first job (lucky him) was as a “song plugger” in New York’s Tin Pan Alley. His task was to play the latest pop songs for vaudeville performers looking for new material. He took home $15/week – not bad for a teenager – though the greatest benefit of the job was deeply absorbing the popular music of the day, which was to serve him well later on. As every musician knows, any piece of music can get old after a while. To sustain his interest, Gershwin learn to arrange and improvise upon the songs he was hired to play. He later did the same with his own tunes, rarely performing them the same way twice at concerts and parties. His characteristic style can be heard on a recording that every keyboard player should know, Gershwin Plays Gershwin: The Piano Rolls (Volumes 1 and 2). From The Piano Rolls, listen to Gershwin’s recording of his beautiful and timeless song That Certain Feeling.